Frank Lloyd Wright, internationally recognized as one of the leading modern architects of his day, is best known for creating a new form of American housing, the prairie house, as well as the award-winning single family home, Fallingwater. Frank Lloyd Wright is commissioned by the wealthy Pittsburgh businessman Edgar Kaufman Sr to build a weekend home in the rural Bear Run area near Pittsburgh, Pennsylvania, USA. Kaufman requested a simple structure overlooking the waterfall and its attendant cabins. Instead Wright asked for a survey of the area surrounding the waterfall, including all the boulders and trees. He then proceeded to to build one of the most acclaimed works, witch was voted “the best all time work of American Architecture” by the American Institute of Architects, despite some structural issues and problems with damp. A spectacular example of organic architecture, a harmonious blend of man and nature through design, Wright used every modern construction tool available in 1935 to create this naturally integrated home, seemingly part of the underlying rock bed and waterfall. 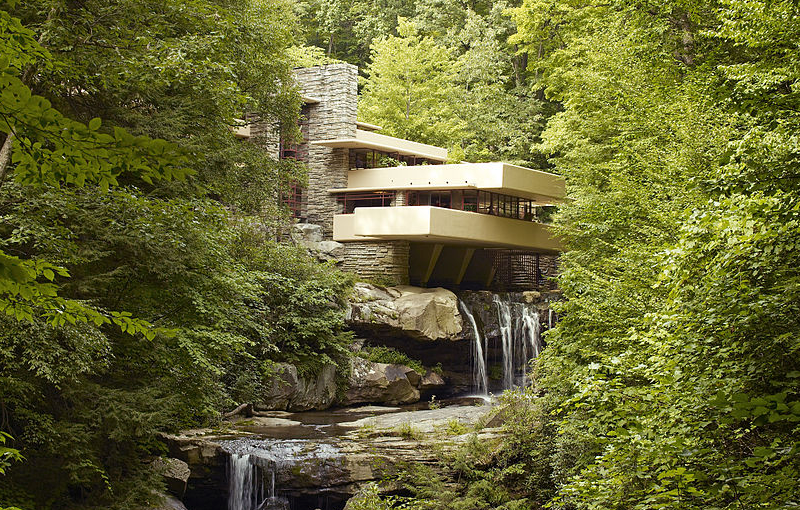 Mimicking the natural pattern of the existing rock ledges, Wright built the house over the falls in a series of cantilevered concrete “trays”, using the same material as the boulders, Pittsville sandstone, for the walls. Rising more then 9 m (30 ft) above the falls, Wright’s strong horizontal lines and low ceilings maintain the sheltering effect, which is seamless with the exterior. He build as much floor space on outdoor terraces as he did indoors, effectively bringing the outdoors inside. Completed in 1939, Fallingwater is the only Wright house with its original Wright-designed furnishings and artwork intact open to the public. The Kaufman family’s collection of fine art, textiles, objects d’art, books and furnishings, witch they collected from the 1930s to the 1960s, is on view, representing the eclectic tastes of a sophisticated, well-travelled family. Works by Audubon, Tiffany, Diego Rivera, Picasso, Jacques Lipchitz, Richmond Barthe and by Japanese artists Hiroshige and Hokusai can be seen in this magnificent modern architectural wonder, a reminder that only our imaginations have limitations.